Moscow (TADIAS) – Ethiopia’s London Olympic champions Tirunesh Dibaba and Meseret Defar will contest just one event each at the 2013 athletics world championships in Moscow, with Tirunesh running only the 10,000-meter final on Sunday August 11, team officials confirmed on Wednesday. Meseret will run the 5000-meter elimination round next Wednesday morning before the final takes place three days later, on the evening of Saturday, August 17. The two women had been entered in both of those events and were considered favorites to medal twice, while the double gold medal feat that Tirunesh achieved at the 2005 world championships and 2008 Beijing Olympics has served as a tantalizing prospect. “It’s very difficult for athletes to run three races in one week,” said the Ethiopian athletic federation’s head coach Dr. Yilma Berta in Moscow on Wednesday. “It’s better for them to contest one event each, and take one event each.” The team believes the strategy would set up two golds for the nation. For the 2004 and 2012 Olympic 5000 champion Meseret, who has medaled repeatedly over that distance, but never yet over 10,000, running the longer event first could jeopardize her chances for the shorter event. It appears to have done so in the 2009 and 2011 world championships, where she ran both events but took just one bronze medal in the 5000m. In 2009, as in 2013, she had run one of the year’s two fastest 10,000m in the world before the championships, but that did not guarantee a medal. Meseret will be joined in the 5000 by Almaz Ayana, who in July ran the second-fastest time any woman has run this year. That race, in Paris, was won by Tirunesh, who at the time was looking forward to racing over the distance in Moscow in addition to the 10,000. “She wanted to run both and she had been preparing for both,” said her sister Genzebe Dibaba on Wednesday in Moscow, where she arrived ahead of her sibling. “She’s in better shape than she was last year,” added Genzebe. The 5000 world record-holder Tirunesh did run both events in London last year, and finished the 5000 in third place after losing a final sprint to her track arch-rival Meseret, who was coming into the race with fresh legs and a fierce determination to regain the Olympic 5000 crown. No such double attempt is in the federation’s plans for 2013, and Ethiopia’s only Moscow 10,000 and 5000 double gold that will be in the history books when these championships are over will be the legendary Miruts Yifter’s from the 1980 Olympics. 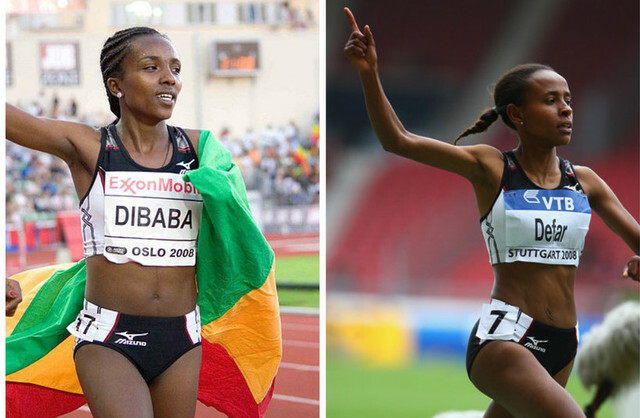 Genzebe also qualified for two events in Moscow, the 5000 and the 1500, in which she is the fastest Ethiopian of the year and the only one to have run under four minutes. “The federation wants me to contest the 1500, since there’s a shortage of athletes in it,” said Genzebe, who will run the event’s first round on Sunday morning, August 11. The overwhelming favorite to win that event’s final is Ethiopian-born Abeba Aregawi, who represented the nation at last year’s Olympics, but had established ties with Sweden previously and now represents the Scandinavian nation. Ethiopia does have a favored athlete in the Moscow middle distance events, as Mohammed Aman runs the men’s 800m, which starts its first round of races this Saturday morning in the absence of Olympic champion and world record-holder David Rudisha of Kenya. Olympic champion Tiki Gelana and former world track and cross country medalist and 2012 Frankfurt marathon champion Meselech Melkamu run the Moscow women’s marathon Saturday afternoon, after which London women’s steeplechase bronze medalist Sofia Assefa competes in the first round of that event. The 2008 Olympic and 2009 world championship double gold medalist in the 10,000 and 5000, Kenenisa Bekele, is entered as a reserve in the men’s 10,000 final, which takes place Saturday evening. Kenenisa was the fourth-fastest Ethiopian this year in both of his events, after winning the 10,000m in Eugene, Oregon in May. That race was initially scheduled to serve as a trials race for the Moscow 10,000m, where the first three Ethiopians would automatically make the team, but that plan was abandoned before the Eugene Prefontaine Classic meeting, and Moscow selections were made based on athletes’ fastest times for the season. “There was a plan to hold a trials race there, and then there was another plan to hold it somewhere else, but neither plan worked out,” said Dr. Yilma. Ethiopia ordinarily selects athletes for track championships based primarily on fastest times, and Kenenisa, who is gradually coming back from injury-plagued years, ran several races this season in search of fast times. The fastest man in the world over 10,000 this year is the London Olympic 5000m silver medalist Dejen Gebremeskel, who won his first race ever over the distance in Sweden in June, leading his compatriots Abera Kuma and the 2011 world 10,000m bronze-medalist Imane Merga to similarly fast times. The three men will be joined in Moscow by the surprise 2011 world champion, Ibrahim Jeilan, whose role as defending champion allows him automatic entry into the event. Ibrahim beat Britain’s Mo Farah in 2011, but the Somali-born Farah enters the 2013 race as the reigning 10,000 and 5000 Olympic champion, and is even more heavily favored this season – not that that will stop the 5000m bronze medalist from 2011, Dejen, and his teammates from aiming for another upset victory. Most of the Ethiopian athletes running in the first few days of the championships arrived in Moscow on Wednesday along with team coaches and officials. They were greeted by Ethiopia’s ambassador to Russia, Kasahun Dender Melese, who met the delegation inside the arrival area at Domodedovo airport. Members of Moscow’s Ethiopian community gathered in the waiting area of the terminal holding Ethiopian flags and wearing wrist bands and scarves in the flag’s green, yellow and red colors, while some women were decked in traditional outfits from head to toe. Ululations and cheers arose when the delegation appeared, and later, flowers were presented to the London Olympic medalists in the squad. “We want to support them all,” said Moscow businessman Gezu Gebru. “But to tell you the truth, we also wanted to meet them up close. We always watch them race on television, but this was an opportunity to see them in person.” Gezu and others in his community will also get to see the star athletes racing live in Moscow’s Luzhniki Stadium and on the streets of the city during the marathons, starting Saturday morning. The championships end on August 18.